Friday afternoon, 5 May. Bright and sunny (20C), but no sign of the hatching yet. It looks like incubation business as usual today. Here she is, sitting quietly for a moment, breathing at about 120 times a minute. The white patch above her tail is a large white feather which is nearly as long as she is! Then at about 6.30pm everything changed when Sheila spotted the female pulling half an eggshell from underneath her.She then went on to eat most of it. This happened at just after 6.30pm. We had to wait another 25 minutes before we had our first glimpse of the chick, when the male arrived with food. After a prolonged interaction between them, throughout which she kept vibrating (rather than flapping) her wings in the manner that fledglings do when they want food, the male held onto the mealworm(?) and the female pecked at it so as to take it from him in small pieces. 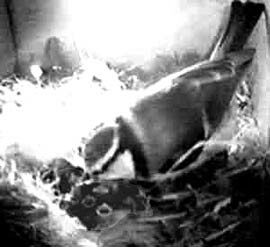 Look closely and in this image you can just see the mouth of the chick in the darkness of the nest cup. The female is at the left of the picture. Saturday 6 May turned out to be a hot day in more way that one. It was sunny and the temperature in my garden got up to 28C in the afternoon. By 11am we could see at least 5 chicks and the feeding had well and truly started, by both the female and sometimes the male as well. The day was then a mixture of feeding and continued incubation of the remaining eggs which the female continued to rattle around as if there were no chicks about. A careful look at this image will reveal 4 tiny chicks hoping to be fed by the male. Sunday 7 May was another very warm day ( max 27C), if somewhat less sunny. We have been able to see at least 6 chicks at least once today. During the afternoon the female seemed to be quite uncomfortable at times and spent time standing n the corners of the nest, beak open as if she was panting to cool down. Feeding has kept both parents busy and they have been bringing in an assortment of food for the chicks. from mealworms to what appeared to be a thin legged spider or harvestman. When the parent enters the nest the chicks do not normally appear until the adult gives what sounds like a rapid series of clicks. Then the heads pop up in a very random way, necks stretched and mouths wide open. They are very unsteady at this stage and are prone to falling over like skittles! The parent does not put all the food into one open mouth, but seems to share it out . It has been interesting to see the parents apparently cooperating to break down larger food such as a meal worm into smaller pieces before offering it to the chicks. . The left hand image shows most of the family together for breakfast at about 8.20am. 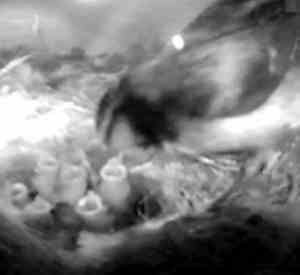 The right hand image shows the first chance I have had to 'snap' eight chicks, at about 7.30pm. 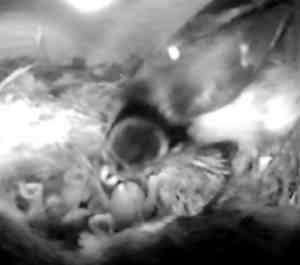 The feeding did not stop until about 8.20pm, when the female finally came into the box for the night. At 8.45pm she suddenly pulled out from under her some egg shell pieces and ate some of them. Although the chicks were uncovered during some of this they did not move at all. Tuesday 9 May was a humid day (max 24C), cloudy with some sunshine in the afternoon followed by a short period of heavy rain. Eight chicks is still the confirmed total so far. 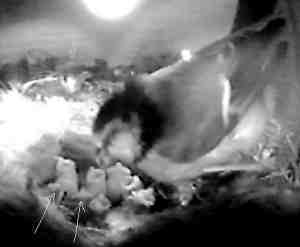 Feeding continued all day from 5.36, with the male appearing with food within a couple of minutes. On of the first things the female did was to take out of the box the largest piece of eggshell left from last night. I counted the number of feeds by each parent over a 6 hour period starting at 1pm. The female brought food 58 times and the male 64 times. The rain just after 5pm disrupted things somewhat. The female spent nearly 20 minutes in the box, sitting on the chicks for most of the time and doing a bit of preening. As soon as the rain eased the male, who looked soaked, went into overdrive and in the next 45 minutes he arrived at the box with food 20 times. In the same period the female made 10 trips. On a number of occasions, if parents were in the box at the same time, the food was passed from one to the other before being offered to the chicks. Inevitably now the parent seems to try each mouth for size or eagerness as the food is offered. Often, after the food has been eaten, one of the chicks then presents its rear end and voids its white,encapsulated droppings which the parent either eats or takes out of the nest. In the following sequence the male feeds a chick with a mealworm. The same chick then does a headstand. The male waits until the 'package' is presented. He then takes it and leaves the box. 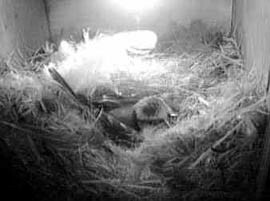 The female finally entered the box for the night at 8.15. However, at 10.30pm she was still very much awake. She frequently got up off the chicks and stood at the side of the box for several minutes at a time. It was not until after 11.30pm that she seemed to get more settled and get her head under her wing for the first time. Wednesday 10 May. 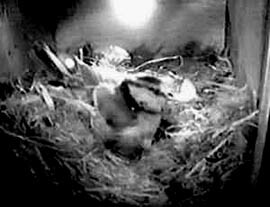 This morning the female was awake by 5.15am and joined at 5.20am by the male bringing in the first food of the day. No time was being wasted on a bright, dry morning. I am thinking about how much the chicks have grown since last weekend, and they are noticably more downy now, and they are increasingly vocal. It is little wonder considering the amount of food provided for them. 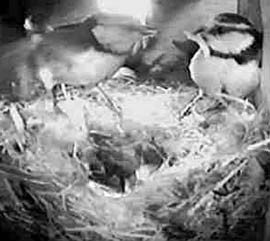 By the time the female stopped for the night at 7.55pm the pair had brought food to the box 319 times - mum 148 and dad 171. The male was very active in the late afternoon. The weather had by now become cloudy and decidedly damp with a high of 19C. The feeding through the day seemed to show a vague pattern of 'work sharing' between the parents so that for periods of varying lengths one parent would do the bulk of the feeding. For example, in one half hour period in the morning the female brought food 9 times to the males 2 times. 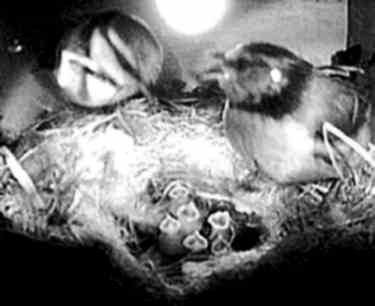 In the afternoon a similar period saw the male feed the chicks 9 times while the female did not appear in the box at all. The female had numerous periods when she sat on the chicks though the day but, as happened last night, she found it necessary to go to the corner of the box to have a peaceful moment . 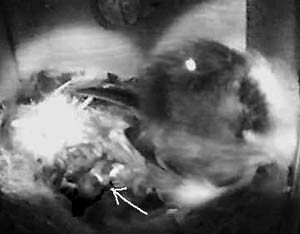 In the evening, when feeding was over, she did this for quite a long time, fluffed up and head tucked under wing as this image shows ( You can see the circles of light produced by the Infra-red LED's) Two of the chicks (arrowed) appear to look on hopefully, although at this stage they are still blind. Thursday 11 May followed much the same pattern as yesterday, with feeding starting at 5.15am and continuing until the female retired at 8.05pm. She was still finding it difficult to settle at 11.15pm. A 'technical hitch' on my part means that I have not been able to come up with any feeding figures today. 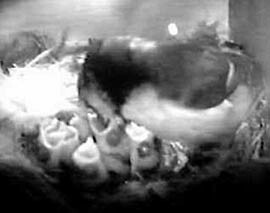 This picture shows the female delivering a mealworm at about 7.10pm and shows just how much the chicks have grown. The Chicks - The race to first flight.